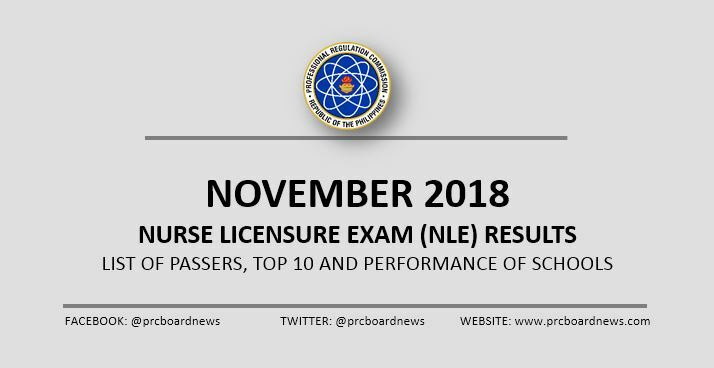 MANILA, Philippines - The Professional Regulation Commission (PRC) and the Board of Nursing (BoN) released official results of November 2018 nurse licensure examination (NLE) or nursing board exam on TODAY, December 7, 2018 or in 14 working days after the exam. The complete list of passers, top 10 (topnotchers), top performing schools and performance of schools are available on this page as announced online. UPDATE: 4,811 out of 12,033 (39.98%) passed the Nurse Licensure Examination. PRC administered the nursing board exam on Saturday and Sunday, November 17 and 18, in Manila, all regional offices nationwide (Baguio, Cagayan De Oro, Cebu, Davao, Iloilo, Legazpi, Lucena, Pagadian, Tacloban, Tuguegarao) and Zamboanga. The November 2018 nursing board exam has drawn basic knowledge, skills and attitudes in the major subject areas i.e. Fundamentals of Nursing including Professional Adjustments, Maternal and Child Nursing, Community Health and Communicable Disease Nursing, Nursing of Adolescents, adults and aged and Mental Health and Psychiatric Nursing. According to PRC Resolution No. 2017-1068 and Pursuant to Section 7 (d) of R.A. No. 8981, the target release of NLE results is on Friday, December 7, 2018 or in fourteen (14) working days after the exam. PRC Board News expects release of NLE results between December 3 (Monday) and December 7 (Friday) or in 10-14 working days after the exams. In the November 2017 exams, results were announced in eleven (11) working days after the last day of exam. PRC named 5,875 out of 12,869 who passed the NLE. University of Santo Tomas (UST) dominated the schools with 100% passing rate. Raymund Kernell Balmaceda Manago of University of the Philippines (UP) - Manila aced the board with 89.00%. December 6, 2018 Update: NLE results are expected to be released on Friday, December 7, according to a reliable source. December 7, 2018 Update: NLE results are out today! Updating, now stay tuned na 😊 please count her in Lord Hazel Dale Geronimo.